A large crowd followed a closely-fought Gingin Heifer Competition last week. The competition held last Thursday toured 15 properties in the greater Gingin area with 104 heifers on show. Travelling in convoy from farm to farm throughout the day, a crowd of onlookers watched the judging of the heifers take place at each property with judge Kevin Yost, Liberty Charolais and Shorthorn studs, Toodyay, given the tough job of picking the winners. Mr Yost was asked to judge the heifers on their suitability as future breeders and award points for temperament, structural soundness, femininity, carcase quality and evenness of pen. “It was a tight competition with only four points separating the placegetters in the commercial section,” Mr Yost said. This year top honours went to first-time entrant Tim Croot, Koorian, who scored impressively to win the commercial section, when his pen of four Angus heifers scored 92 points out of a possible 100. James Redford, Mogumber Holdings, came in a close second with 91 points also with Angus heifers while third place went to another first-time entrant, Edward Grant, with 90 points for a pen of Red Angus heifers. Fourth place was a tie between David Roe, Benalong and Alan Greenwell, Bullrush Farms, on 89 points, both with Angus heifers. A new trophy for the ‘best four stud heifers’ was donated this year by Angus stud breeders Dale and John Jansen, Fernwood Farm, who incidentally took out first and second place. Mr Yost said it was a privilege to be asked to judge the Gingin Heifer Competition which goes from strength to strength each year. 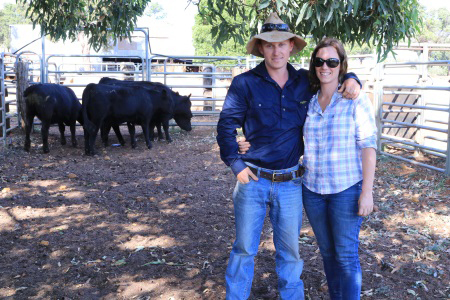 “Breeders in the greater Gingin area are to be commended for their efforts towards producing top quality beef,” he said. “This competition encourages breeders to strive for better animal quality which leads to improved soundness in their breeding stock which was clearly evident as the competition moved around from farm to farm. The lunch-time stop gave the large crowd an opportunity to view the 10 heifers recently won in the Farm Weekly – WA Angus BreedersWin 10 Heifers competition by Stephen and Selga Beckwith who also hosted lunch, which was generously sponsored by the local Gingin Bendigo Bank represented on the day by Stephen Fidge and the wind-up event was hosted by Gloria and Murray Hyne at the local Gingin Scout Hall. Competition organiser George Gifford extended his thanks to the competition entrants, sponsors and to the judge. “We absolutely depend on our sponsors and on breeders being willing to enter the competition,” Mr Gifford said. “This competition is a fantastic opportunity to see what can be and is being achieved in the local area so we’re glad to see numbers increasing. Mr Gifford wished to particularly thank the lunch and dinner hosts and sponsors W & J Greenwell, Merial, Bendigo Bank, Gingin Fuel and Tyres, Zoetis, Westcoast Livestock and Primaries.